The AlertMaxx2 is an intelligent high water level alarm and monitoring system which can be connected to your sump pump and Wi-Fi system. The AlertMaxx2 will monitor the pump stations performance improving efficiency and reduce energy consumption. The AlertMaxx2 performs regular health checks on the pump system ensuring pumps are running efficiently using state of the art sensors which measure 10 different pump parameters and variables and utilises the data provided by the pumps themselves. Think of the AlertMaxx2 as having a virtual pump service engineer ensuring your pump station is working to its optimum performance, monitoring, recording and alerting you and other stakeholders to any potential issues before they occur. 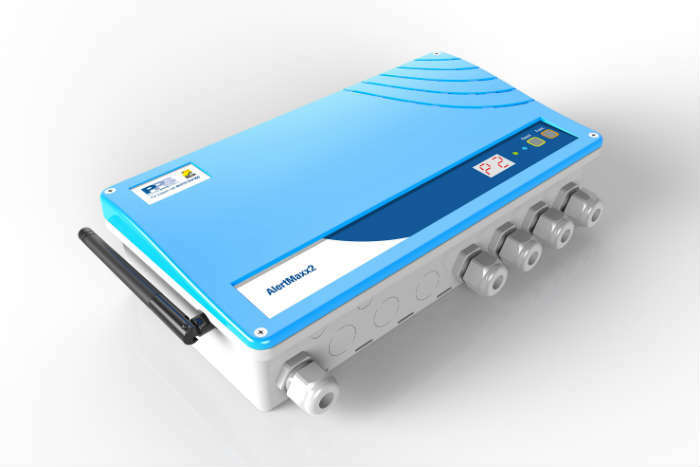 The AlertMaxx2 can collect over 10 different parameters and variables using smart sensors and also utilises the data provided by the pumps themselves (when connected to a PumpSecure/PumpAware plan). The AlertMaxx2 performs a regular health check on the packaged pump system, ensuring pumps automatically via a state of the art sensor built in to the device. The ability for a home owner to see exactly how much energy their pump stations are consuming. AlertMaxx2 measures exactly how much current is being used when the pump/s cycle, which can be converted to Kilowatts /Hours and display back via a simple visual. An increased probability to detect pump failures in advance, thus minimizing costly flood damage. Lower maintenance costs, as service intervals can be extended where the collected data shows the system to be in good condition. Monitoring power consumption and launch trimming actions to increase efficiency and reduce costs. The data in the pump database will allow manufacturers to understand the technology better, which, with ongoing research and development, will ensure constant improvements in products. All-in-all a lower total cost of ownership for the customer. The AlertMaxx2 is compatible with the MaxxFamily products.